My goodness! Of all the jobs I have as Father of the New Order and Saviour of Highsec, one of my favorites is the job of awarding Quintuple Supreme Protector's Tips of the Hat™ when the situation calls for it. Today, it does. Bao Xi upgraded his holdings of New Order shares by 5,000 to a total of 6,000, making him one of the biggest shareholders around. In doing so, he sent us past the 160, 161, 162, 163, and 164 billion marks. This calls for a Quintuple Supreme Protector's Tip of the Hat™. It doesn't get much better than jubilation, folks. As the isk rolls on, our gank ships continue to annihilate our enemy, for our benefit and theirs. What a great start to December! Christmas came early! I am consistently impressed by the generosity of all our shareholders. If somebody came up to me a couple years ago and told me that one day there would be a privately funded SRP for gankers united under a single flag that relied on the honor system, I would've laughed until I hyperventilated. 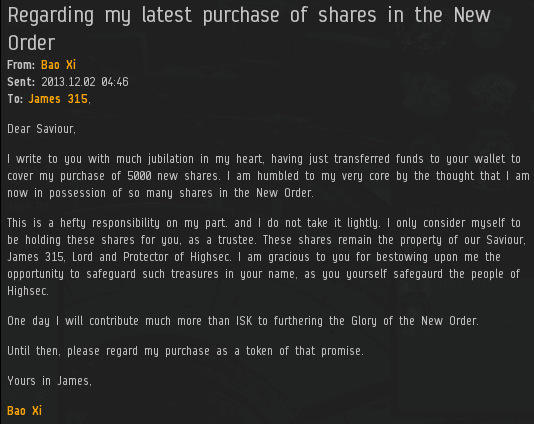 Its great to see so many players across the eve landscape donating isk. Woulsd be even better if more indy players donated to the cause of eve players having fun. i understand your sentiment anonymous, but just in case you werent aware.....indy pilots are supplying the hulls AND the mods that are used. cats, thrashers, t2 guns day after day. i keep my assembly lines rolling. LOL at another alt wasting ISK on gankers to extort in what, ten systems now? James should not be using all of his disability check on PLEX. Don't you need that money for gifts for family and friends? Oh wait, that would presume that you have family and friends.